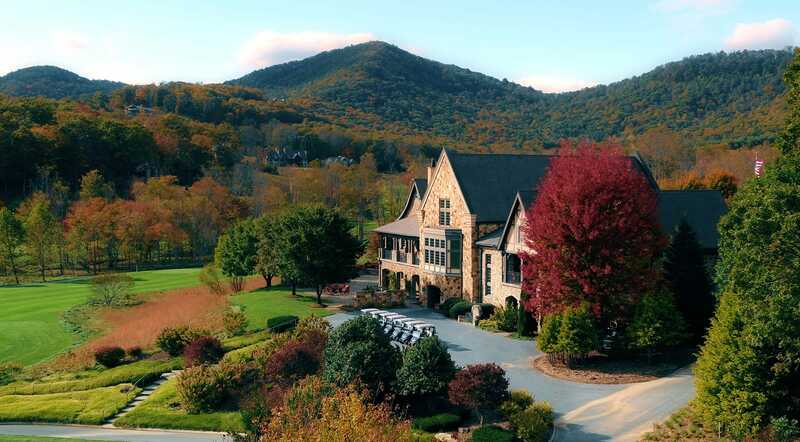 A scene of unparalleled natural beauty inspired by the ageless villages of Europe, The Cliffs at Walnut Cove is nestled in a lush valley, bordered by the Pisgah National Forest and Blue Ridge Parkway and is just minutes from downtown Asheville. 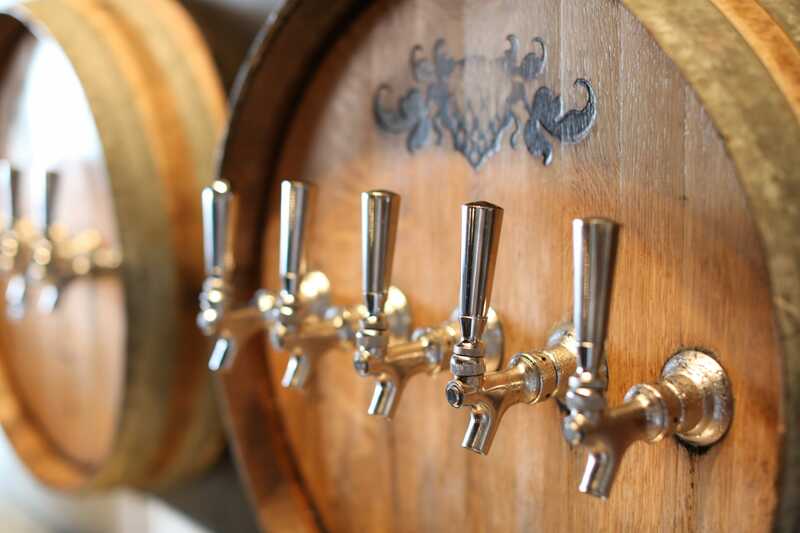 The town is on top of every travel writer’s list in no small part because everything thrives here — the fine arts, music, crafts, cuisine and especially, craft brewing. Here, residents enjoy the convenience and excitement of living in one of the nation’s best small cities, with the calm and ease of a private golf community including nationally-acclaimed golf, delectable dining and a state-of-the-art Wellness Center, plus exhilarating adventures with newfound friends and neighbors. 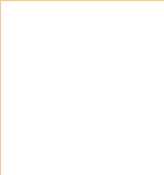 Homes and Townhomes from $850,000-$4 million+. 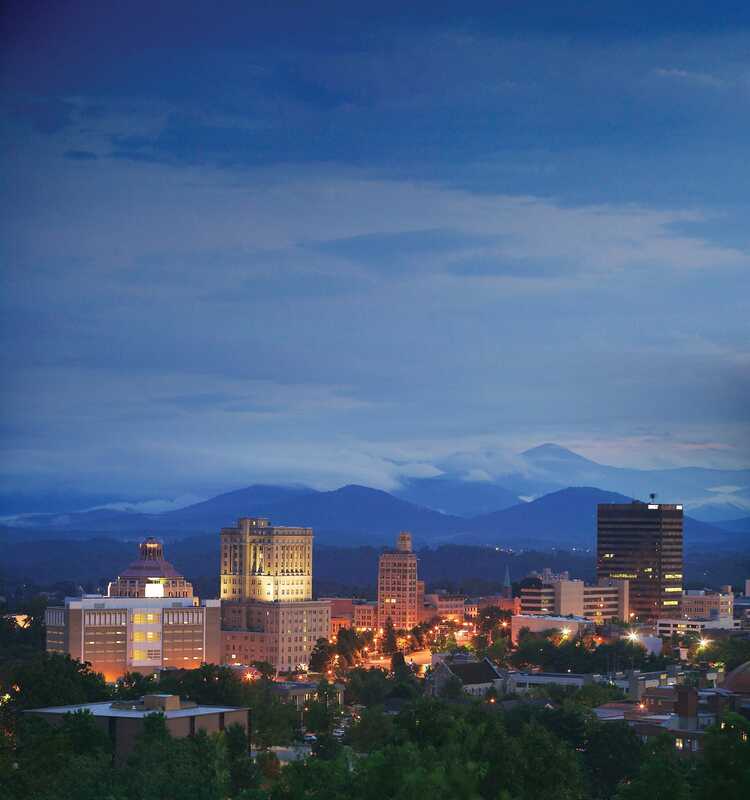 Just 10 minutes to Asheville Regional Airport and 20 minutes to Downtown Asheville. 1 hour to Greenville. 1 hour 15 minutes to Lake Keowee. 2 hours to Charlotte. Pet- and family-friendly walking trails within the community travel past waterfalls, wildflowers and beautiful scenery. 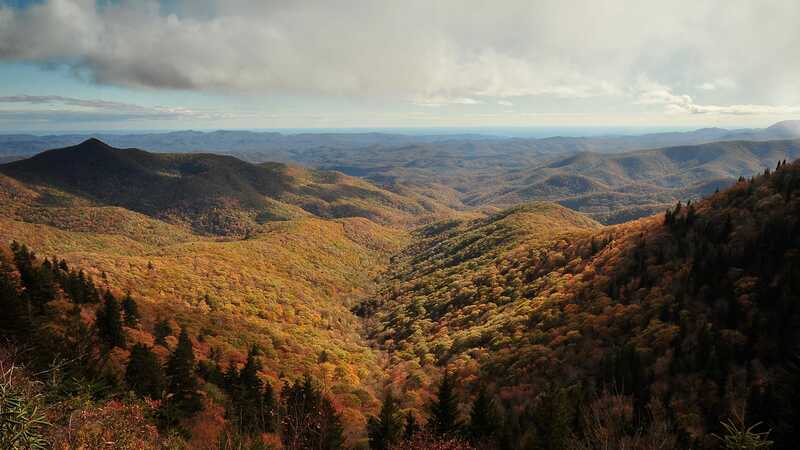 Just outside the gates is the famed Blue Ridge Parkway, home to endless hiking, cycling and outdoor recreation. A Jack Nicklaus Signature masterpiece is one of the Carolinas’ most dramatic courses, playing across open fields of former farmlands and around babbling mountain streams. An impressive Wellness Center features indoor and outdoor pools, tennis and fitness programs. 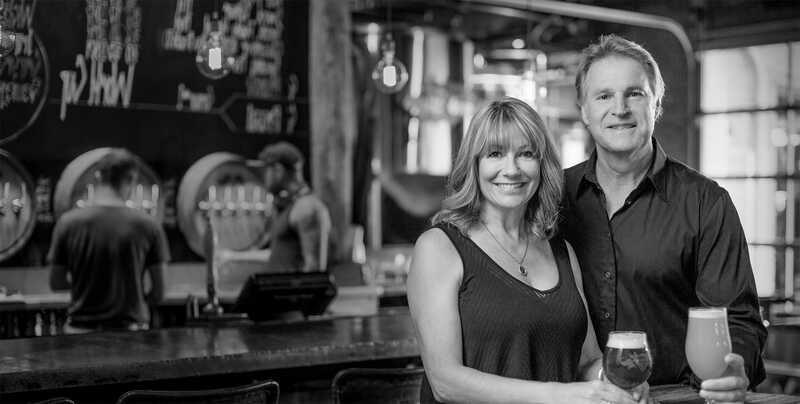 The Tudor-style Turnhouse and Tavern are the heart of the community. 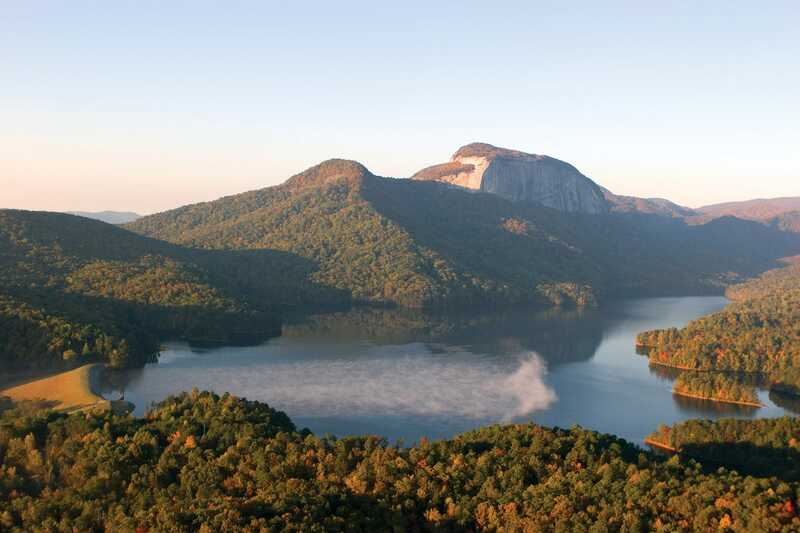 The Blue Ridge Mountains and the Parkway itself are literally your backyard. 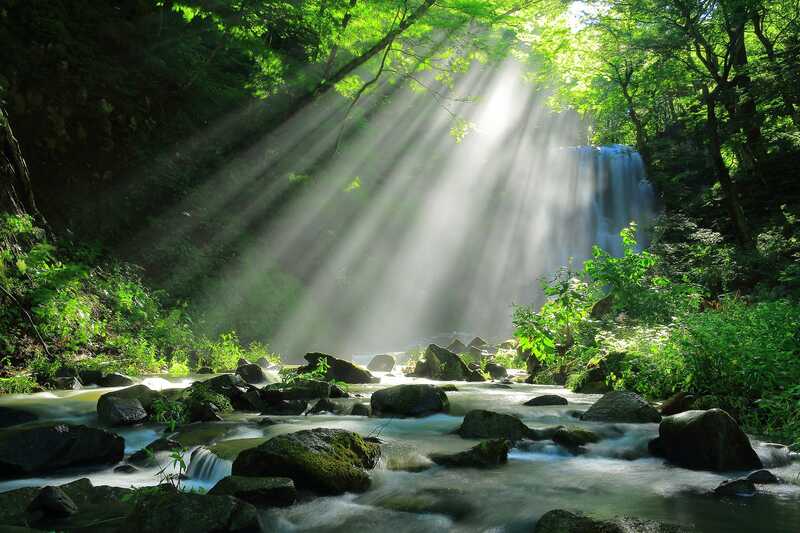 Traverse miles of hiking trails within the gates through lush wildflower fields and thickets of mountain laurel, or venture further afield to more than a dozen beautiful, natural parks via one of the nation’s most scenic parkways. Upon its opening, Golf Digest named it the country’s best new clubhouse. And why not? The Tudor-style Turnhouse and Tavern are a vision straight out of a Dickens novel, except that the food is sensational. Across the cobblestones is the Golf House, an equally stunning venue dripping in rich walnut from its stately locker and game rooms to the golf shop. 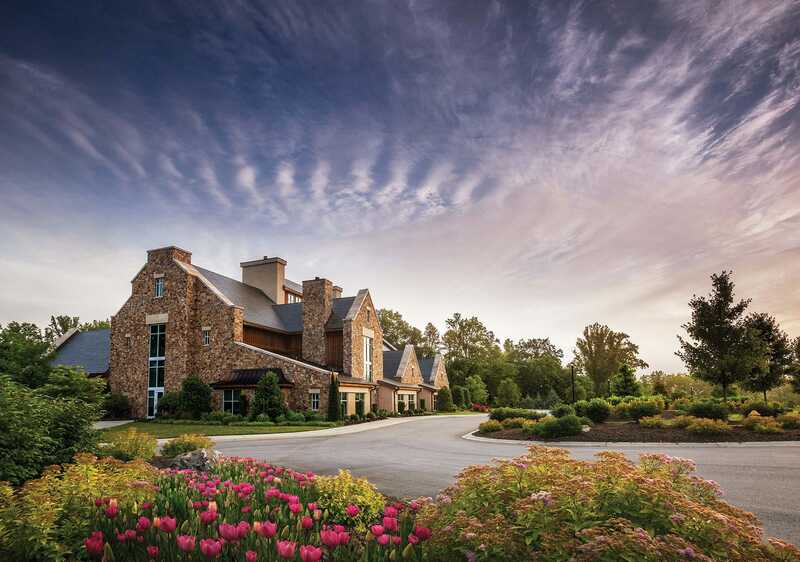 In the world of club amenities, Walnut Cove knows few equals. 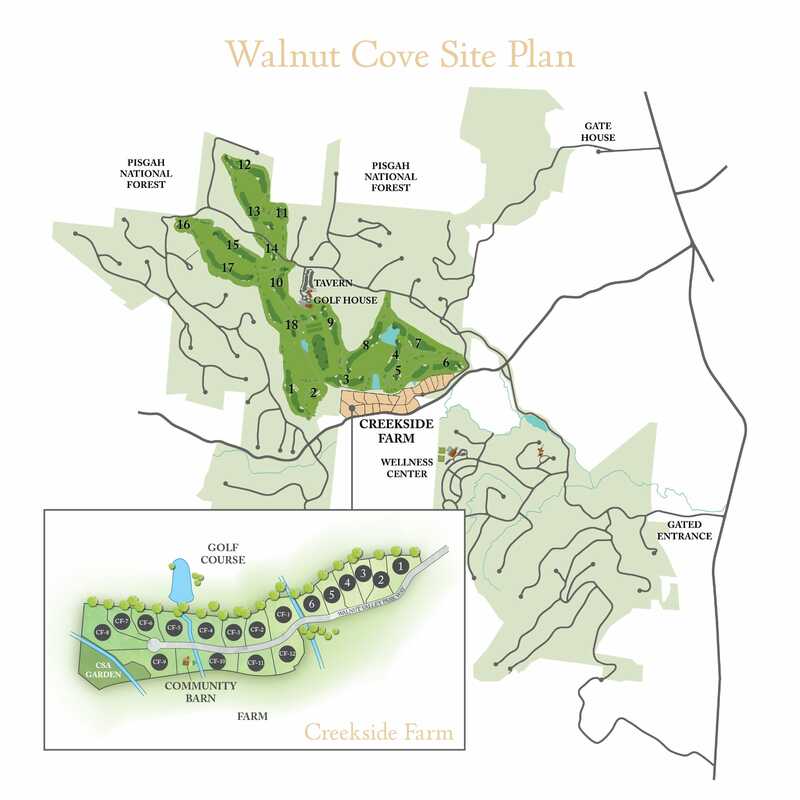 Within the gates of Walnut Cove lies Creekside Farm, an idyllic 60-acre working farm. A Community Supported Agriculture (CSA) program provides members with heirloom vegetables, fresh fruits, fragrant herbs and eggs from free-roaming chickens. These same farm-fresh ingredients grace the menus at the Walnut Cove Tavern and clubhouse restaurant. Modern Living, Old World Charm. 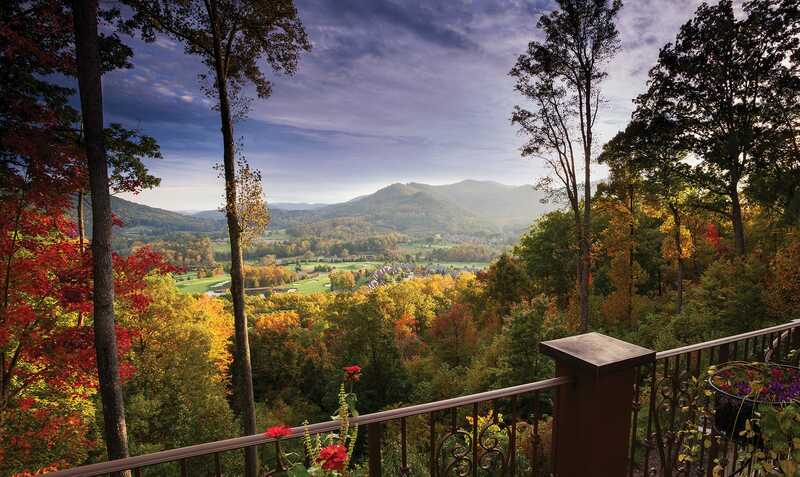 Walnut Cove offers the convenience and excitement of living in one of the nation’s fastest growing cities combined with the calm and ease of a private community immersed in the quiet splendor of the Blue Ridge Mountains. Recognized by the PGA Tour as the only championship golf course to debut in tournament-ready conditions. 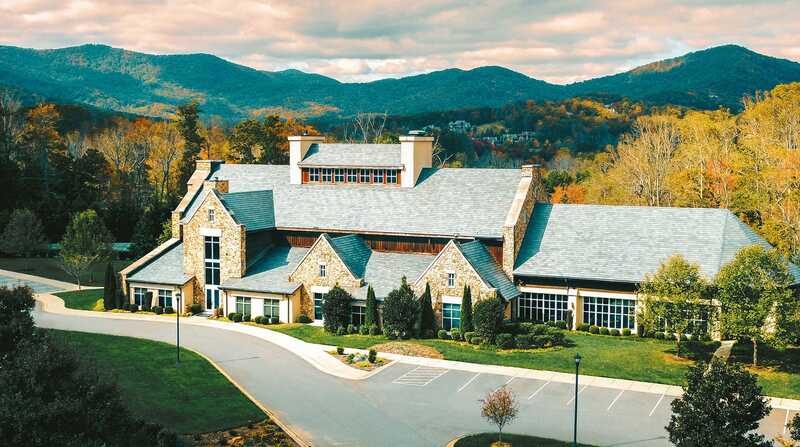 Asheville’s architectural history revolves around the Vanderbilts’ Biltmore estate — a fitting inspiration for Walnut Cove’s Club Village. The picturesque fourth hole at Walnut Cove. 18,000-square feet of cardio equipment, free weights, movement studios and both indoor and outdoor pools are just the start of a wellness complex that redefines the daily regimen. In all of North Carolina there may be few more beautiful settings, where streams and waterfalls cascade from the peaks of the Blue Ridge Mountains. Luxury townhomes, comfortable cottages and Old World-inspired estates are available now, or select homesite on the golf course or with stunning mountain vistas on which to build the home of your dreams. Select a homesite on which to build the home of your dreams or move right in to one of our favorite featured offerings. Homesites start in the $150,000s, homes and townhomes at $850,000. Breathtaking four-season views in every direction are the order of the day. There are two new developer releases of homesites as well, offering unparalleled opportunities to come home to The Cliffs at Walnut Cove. The investment in your home at The Cliffs is one of life’s most significant and rewarding milestones. 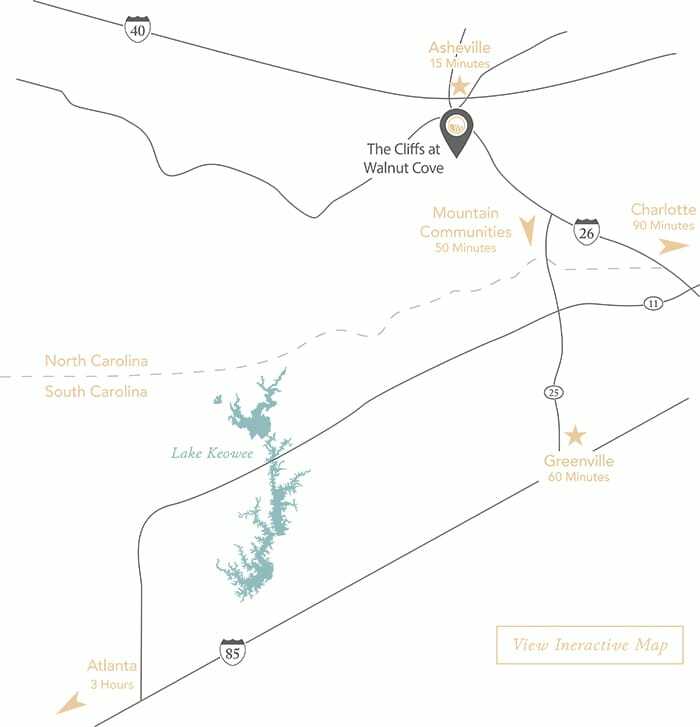 So that you can put a ‘check’ mark beside all the important criteria you look for in a builder, we’ve assembled and vetted the leading builders bringing our owners’ visions to life at The Cliffs at Walnut Cove. You can trust them to be as good to their word as they are to their craft. 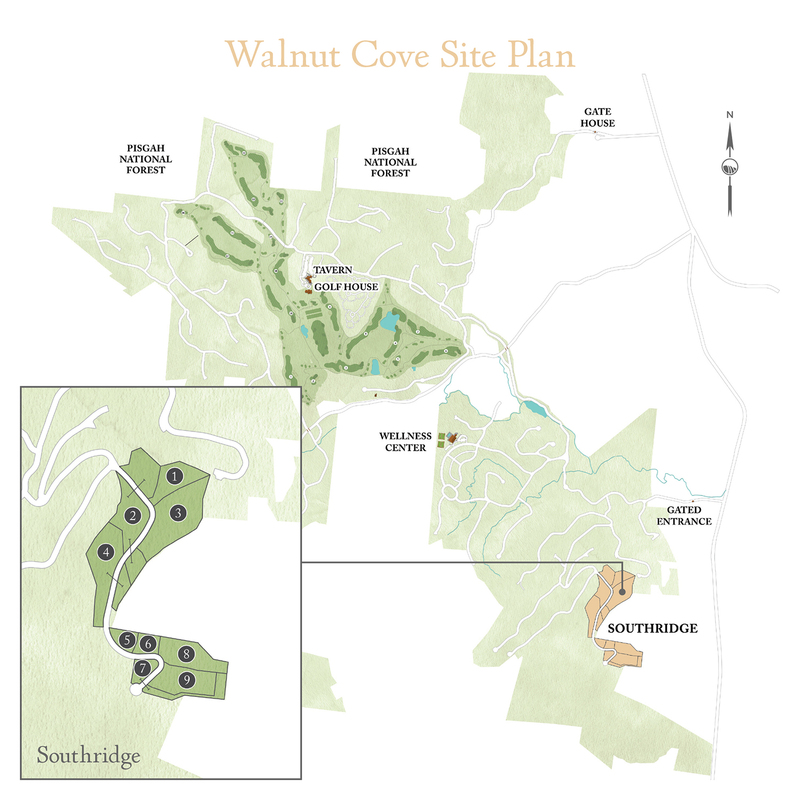 Southridge at Walnut Cove is a limited release of just nine spectacular homesites that have been held in reserve for over a decade. 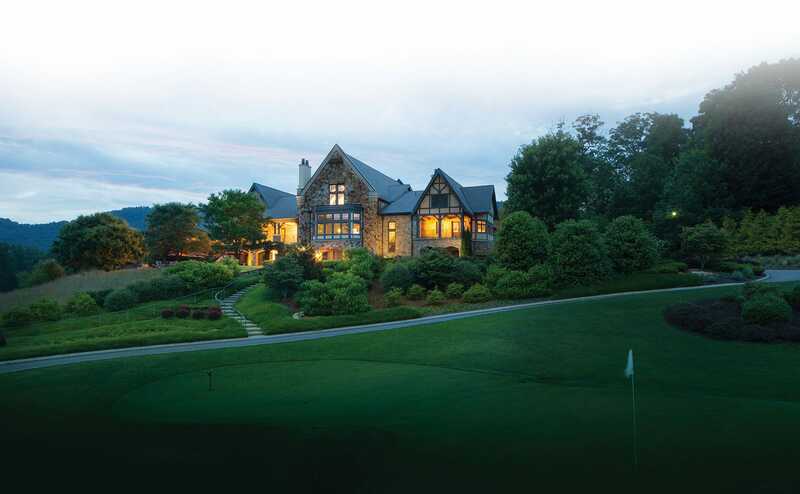 Located on the tenth hole of the spectacular Jack Nicklaus Signature Course, and within walking distance to the clubhouse, Somerset at Walnut Cove is an enclave of five exclusive homesites affording dramatic golf vistas, colorful sunsets and convenient access to Walnut Cove’s luxury amenities. Home packages are also available upon request. 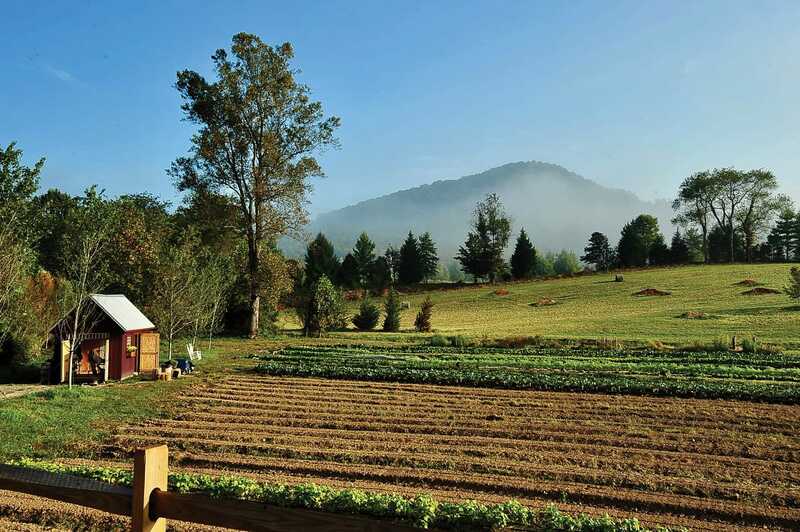 Creekside Farm at Walnut Cove is an agricultural neighborhood immersed in growing food and celebrating it with friends and family. 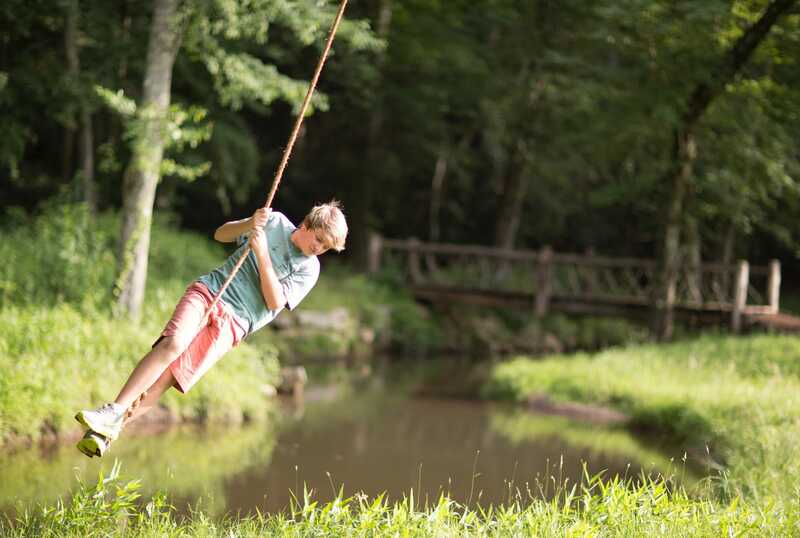 Plant your roots on one of our 18 exclusive homesites and reconnect with the land. 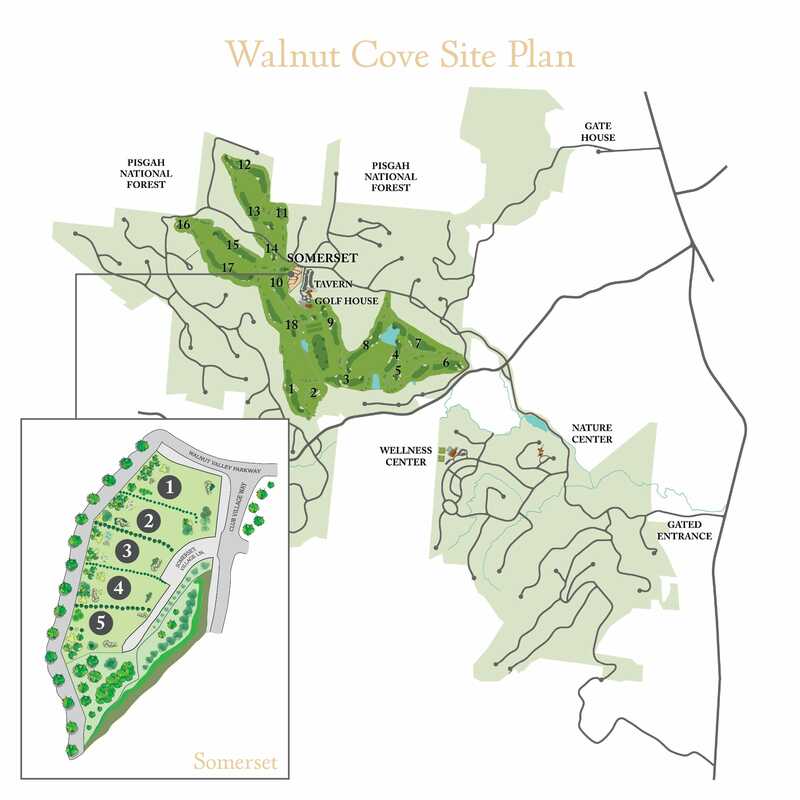 Homesites also look over the Walnut Cove signature golf course offering the best of both worlds.